NEW YORK CITY— It is a brisk day here, a sea of people standing side by side making a “line” as ordered before the tall entry doors. Those without a ticket walk by and stare in curiosity of what everyone is about to embark. The cries of babies prevail throughout as people begin to get impatient and press their way to the front. A man appears on the other side of the barricade and without a word starts to play a steel pan. Street performers emerge alongside the gentleman and silence reigns as the melodies and acts fill the air. Guards are posted up at every point you pass providing safety and guidance to those who purchased a ticket. The Ellis Island Immigration Museum is expanding its scope to include all immigrants, not just who arrived on the island (Photos by TaylorAnn Miller). Down a ramp, you go leading only to outside. You are no longer part of your city; you are part of the ship. Standing on the dock looking out onto the Hudson River; you see free, open waters, with the Statue of Liberty towering in the horizon. The only tunes playing now are from the squawks of seagulls and water crashing among our sides. A ship slowly glides its way to the dock, reading “Journey to Freedom” on its side. The crew quickly docks the ship and orders you to walk the plank aboard. You tilt your head back to see the top of the ship and instantly feel it overpowering you. The Statue of Liberty rises above trees at the ferry site where visitors heading to the park begin their journey. On the other side of the plank, is a dull lit room with steel metal benches along nothing but pale-colored walls. The smell of New York pretzels and hot chocolate fill the cabin, as your eyes are drawn to the only vibrant aspect in the cabin, the snack stand, serving food, drinks, and souvenirs. You continue to walk on through, passing all ages, diversities and genders. The ship rocks side to side making you seasick, so you are told to go further up. The fresh air brushes your face as you reach the open deck. This ship has three stories, fitting as many passengers as possible per journey. The ship is filled to maximum capacity, but you spot an opening on a bench and sit next to a group of strangers. You don’t know them, they don’t know you, yet despite the differences, you both have similar feelings of uncertainty and excitement. 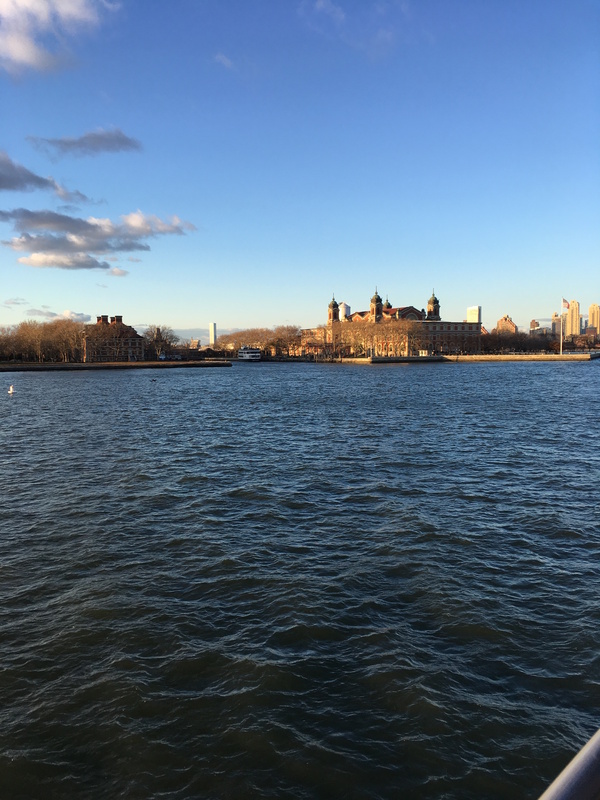 Click on the video at the left to view a multimedia slideshow about visiting Ellis Island prepared by writer TaylorAnn Miller. The captain comes over the intercom, but not much is heard due to the commotion around. All of the benches face the plasma TVs secured on the wall and not until you begin approaching the Statue of Liberty do they launch a video. The video brings you back in history when travelers like us first saw the statue. The site of “Freedom” which was now in arms reach. A mix of emotions flood through, sending large herds of passengers to exit the ship to get a closer look at Ellis Island, part of the Statue of Liberty National Monument. People stare in awe of the statue that symbolizes so much. Selfie sticks come out and National Park Service rangers form groups to guide. The crewmen take on more passengers and the ship then continues the voyage to the island. The plasma TVs start up again, showing how passengers in history felt and did when approaching Ellis Island, connecting us to that feeling. This video makes you imagine just how it was and how different it is now a day. “There were no benches, there was no snack bar, there was certainly no TVs or any entertainment. The feeling of the ship being crowded didn’t feel as crowded anymore compared to the number of people that were on the ship with me,” said Anna Spagnolli, a tourist who was a past immigrant through Ellis Island now going back to tour with her family and grandchildren. Anna Spagnolli, traveled through Ellis Island with her sister in 1953. Since then she had never come back. 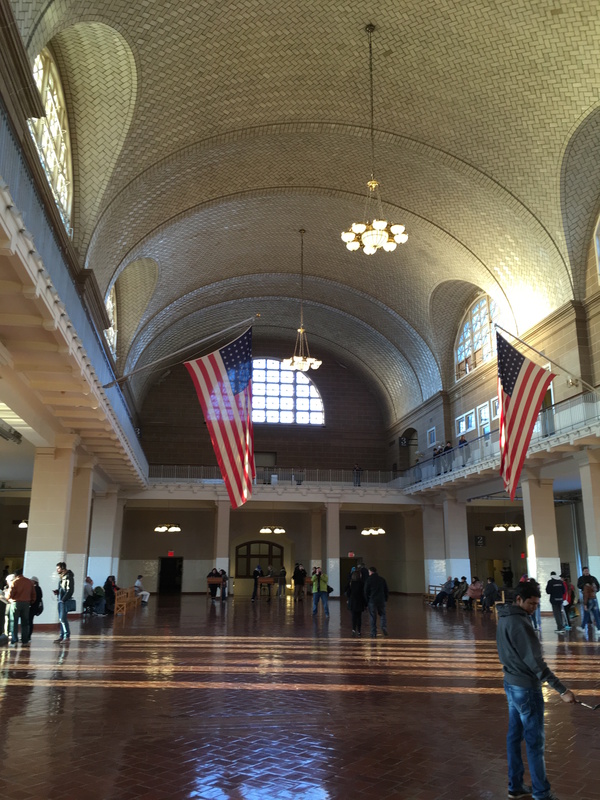 Anna Spagnolli shared that the Ellis Island experience was not an easy one but well worth it. 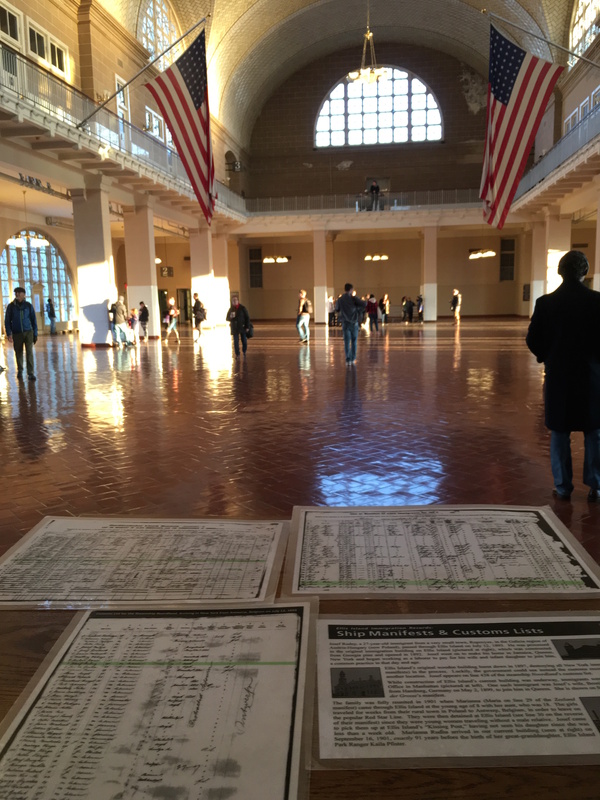 Visitors can tour the impressive main Great Hall at Ellis Island. The intercom comes into play again and welcomes you to Ellis Island. Silence spreads again on the ship. The ship continues to rock, making the plank unsteady. Officers wearing uniforms greet the ferryboat. They shout and motion the passengers to walk down the gangplank to the main building. First step back onto land and before you is a grand red brick building surrounded by lanky trees, fields of grass and a garden. A cafe sticks out of the side of the building and an unbelievable view of the New York City skyline. Everything so new to see yet already know it signifies so much, what to feel, what to think, you can’t quite wrap your mind around just yet. 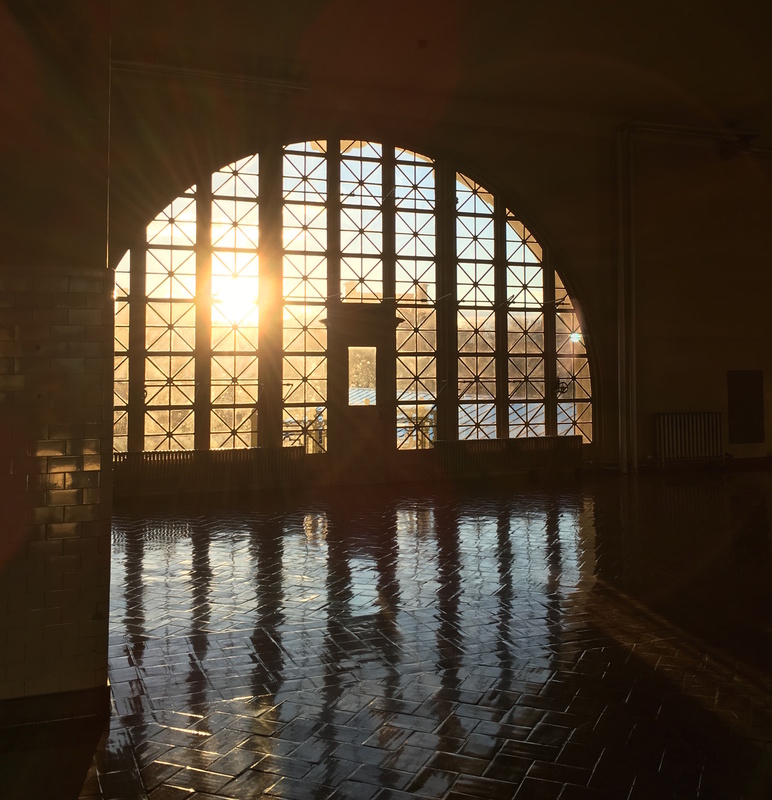 The setting sun casts its late-day light into one of the Ellis Island halls. Shadowing the port are several buildings, which you learn later about. One for the main entrance second is the ferry building, and across the water is the hospital, morgue and contagious disease wards along with offices and housing. This side is now forbidden unless accompanied by a guided tour. Everyone makes their way to the arched path leading up to the massive wooden doors, turning the knob and entering the unknown. 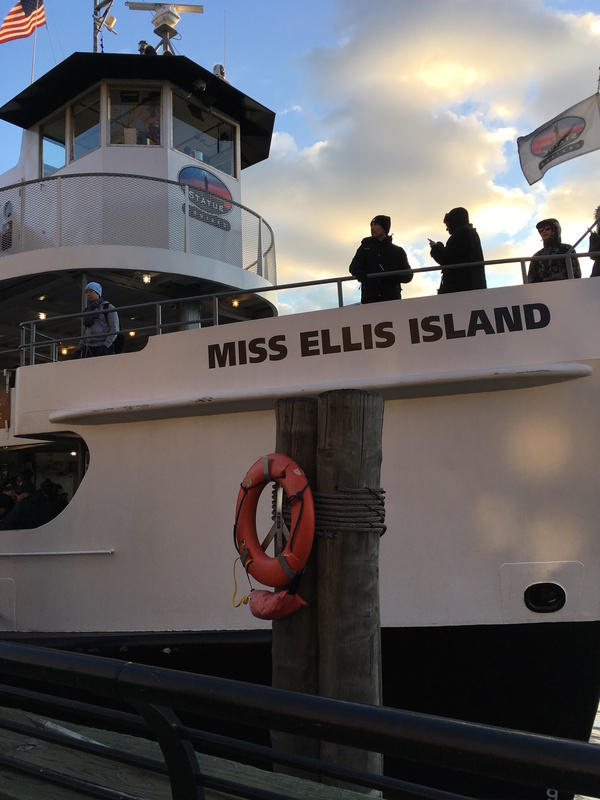 From the moment you step on the dock, the Ellis Island Experience begins. As the immigrants once did in the early 1900s, you enter the Baggage Room on the building’s ground floor. The crowd of passengers follow the process by first climbing the stairs to the registry room. The park’s state trooper stands tall on the second floor and begins shouting over the banister at us all until everyone makes it to the top. During that moment, unknowingly, the medical and legal inspections had started. These inspections were a great deal because it determined whether individuals were fit for entry into the United States or not. The experience feels surreal, awakening every emotion in you. We saw an elderly woman who was having trouble making her way to the top. Some of us helped her. The Manhattan skyline is easily viewed from Ellis Island and Liberty Island. “Don’t you feel like you are walking in a ghost’s footprints?” Ranger Tom Bernardin stated. Ranger Tom Bernardin began and ended the tour with well descriptive information. “Tom was a master storyteller. I could just picture it all, what it may have been like to be an immigrant walking through these halls, not knowing anything, in order to come to America with hopes of a better life,” stated Brian Miller, a tourist. Step by step through the process will have you feeling as if you have become an immigration and feel a sense of coldness and darkness in the atmosphere. Documented signatures, pictures, graffiti and saved artifacts are placed all throughout making it that more personal. The sounds of thousands of voices bounce off the vaulted ceilings. The elderly visitor appeared once again. We saw her among the wooden benches. This woman, Agatha Olari, was alone and looking around the Great Hall. We stopped to talk with her. Olari, 77, came to Ellis Island from Italy. She told us a remarkable story about her journey. 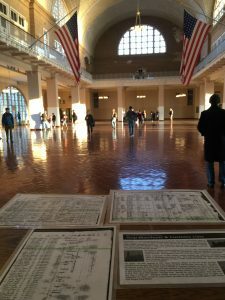 Copies of original immigrant registry books are displayed for visitors to Ellis Island. “Imagine thousands of people in this hall. All the guards were yelling and I could hear people crying or coughing. Officials decided here whether some of us could successfully pass through in a matter of hours, or be detained for further tests lasting days or even weeks. I’ll never forget meeting my future husband on this voyage; he too was from Italy. It was love at first sight. I thought what a great way to start. I started getting sick, though, I wasn’t sure with what. Giuseppe, my husband, helped me all the way, but told me I had to pretend that I was okay to get out,” Olari stated. “However; during the journey, we were separated. Hours went by and after all the inspections, we arrived at the top of another staircase at the end of the Great Hall. There were three aisles and the guard would tell each person which one to take. The unknown scared me, I wanted to leave. When it was my turn they told me to walk down the left aisle,” she said, continuing her story. 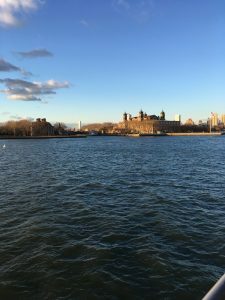 Olari, who lives in nearby Queens with her husband, shared that her favorite spot out of all of Ellis Island is a wooden pillar located on the first floor. This pillar marked a significant moment in their journey. This thick wooden post stands with a plaque on it now, with the name The Kissing Post. Approaching Ellis Island’s main immigration facility on the ferry. As immigrants moved towards the pillar it marked a significant moment in their journey. Cleared immigrants would search for family members who were to meet them here or be reunited with a loved one. The ordinary post developed the name the kissing post by staff members at Ellis Island in reaction to the endless amounts of joyful reunions and kisses seen exchanged between relatives and loved ones. Reaching the kissing post marked an emotional conclusion to their journey to America. The kissing post signified a soundless promise of freedom, reunion and a new beginning to the immigrants. Ellis Island Immigration Museum is part of the Statue of Liberty National Monument and is under the care of the National Park Service. Hours of Operation: First ferry from mainland – 8:30 a.m., last ferry from mainland – 5 p.m., closing ferry – from Liberty Island 6:45 p.m. Visitors on last mainland ferry will only be able to visit one island. Liberty Island closes 15 minutes before final departure of 6:45 p.m. It is recommended to arrive at least 30 minutes before scheduled ferry time you wish to aboard. 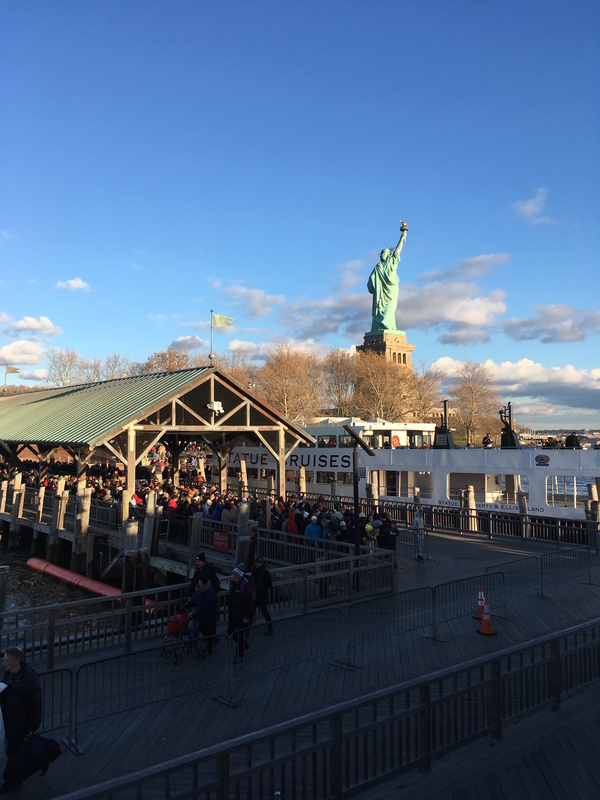 Visitors arrive and depart Ellis and Liberty islands, located in New York Harbor, via ferries operated by Statue Cruises. These ferries leave from two locations: Battery Park at the southernmost tip of Manhattan, and Liberty State Park in Jersey City, N.J. The Miss Ellis Island takes passengers to Ellis Island and Liberty Island. Battery Park, Lower Manhattan, New York City: Visitors boarding ferries in lower Manhattan should use public transportation for parking is both difficult and expensive. 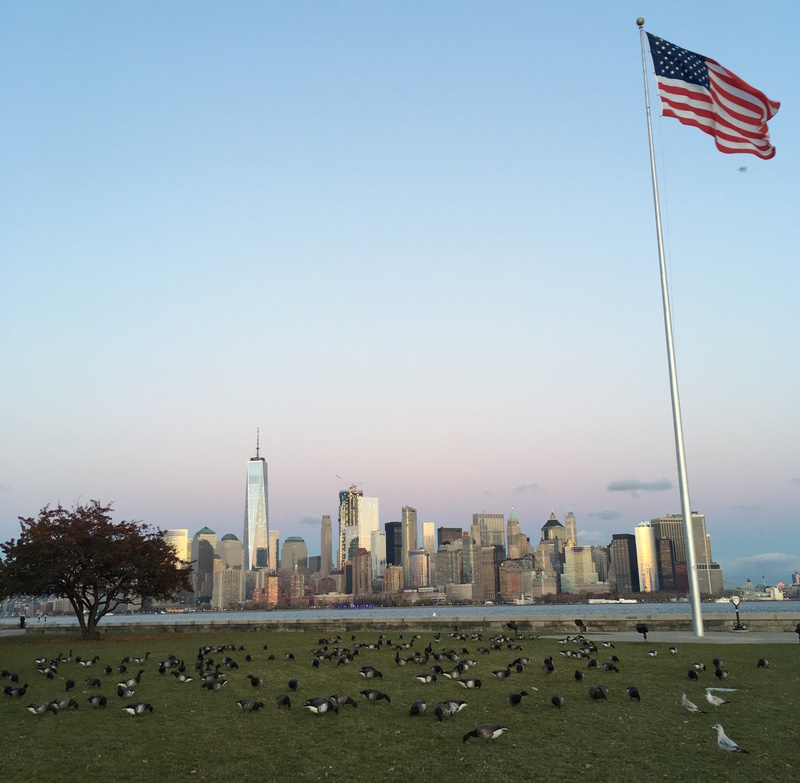 Liberty State Park, Jersey City, N.J.: Driving and parking at Liberty State Park is easier, but even here, visitors have options for public transportation. The ticket office is located inside historic Castle Clinton at Battery Park. It is recommended using public transportation to get to Battery Park as parking is very limited and expensive in lower Manhattan. Visit www.mta.info for more information about public transportation in Manhattan. Battery Park is also accessible by taxi. Local 1 (Seventh Avenue line) to the last stop – South Ferry. Express (Lexington Avenue line) 4 or 5 to Bowling Green. Local from Brooklyn/Queens R/W (Broadway line) to Whitehall Street. M1, M6 or M15 to South Ferry (last stop). Please click on the links below for downloadable PDF directions. The ticketing and departure areas at Liberty State Park are located by the historic Central Railroad of New Jersey Terminal near the water. There is plenty of parking here for a modest fee. This is an ideal departure location for you if you are traveling by car, motor home or private bus. Liberty State Park is also accessible by taxi, ferry and public transportation. More details are available at the Liberty State Park website. Take the Hudson-Bergen Light Rail (HBLR) to the Liberty State Park Station, then walk or bike 1 mile on Audrey Zapp Drive to the ticket office area located by the CRRNJ Terminal. From the ticket office/security tent areas, walk 1/3 of a mile to the ferry gangway for departures. At the entrance of Liberty State Park, the Hudson-Bergen Light Rail is accessible by PATH at the Hoboken Station or Newport (Jersey City) Station. More information about NJ Transit’s Hudson-Bergen Light Rail (HBLR)-Liberty State Park station. Take the Liberty Landing Ferry Service from the World Financial Terminal in New York to Liberty Landing Marina within Liberty State Park, NJ. For more trip planning information visit – Liberty Landing Ferry Service. Authorized guide and assisted animals are welcome. All other pets are not allowed aboard Statue Cruises vessels or within the national park. Avoid extra lines and buy in advance online. Allow five to six hours for tours of both Ellis Island and Liberty Island. Allow two to three hours for a tour of just one of the islands. The Statue of Liberty National Monument and Ellis Island have ongoing programs and tours that may be offered on the day you visit. Check with rangers on Liberty and Ellis Island for the programs that are available on the day of your visit. All visitors can meet the Park Ranger at the Liberty Island Flagpole directly in front of the ferry dock for a 30 minute information program. The ranger will give an in-depth look at the conception, construction and restoration of the monument. You will learn about the history of the Island. The tour times are posted at the Information Center and the Flagpole area. Visit the Information Desk for a schedule of ranger guided tours of the Museum and a schedule of films that run daily at the Museum. Free Ranger Guided Tours – 45 minutes walking tour of the Museum. Free Film – “Island of Hope, Island of Tears” an award winning documentary presented in two theaters. Visit the Information Desk for more information. Self-guided audio tour helps visitors learn more while exploring the grounds at their own pace. For the visual-impaired there is a descriptive audio tour available. The audio is available in Arabic, English, French, German, Italian, Japanese, Mandarin, Russian and Spanish. There are concession stands on all the boats which sell snacks and beverages, as well as merchandise. There are also concession stands, a cafe and gift stores located on both Liberty and Ellis Island. This experience is both indoor and outdoor, make sure to dress for the season when you visit in order to be comfortable and enjoy you’re experience. Summer months expect hot temperatures and humidity. During the winter months expect cold temperatures, and even more so because of the sea breeze. Wear comfortable shoes as you will be walking a great amount. Sandals and open toe shoes are not permitted on the Hard Hat Tour. Large bags or backpacks are not permitted. 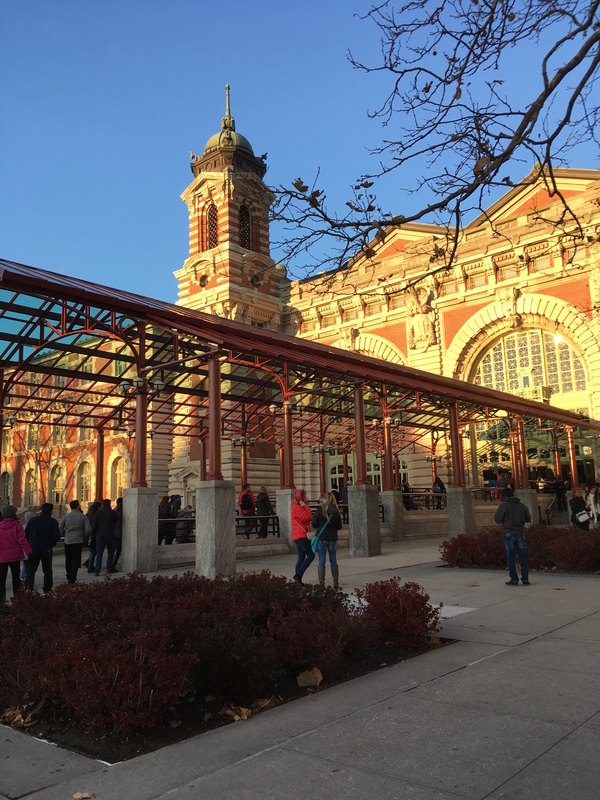 Visitors to the park are required to submit to airport style security screening before boarding vessels departing from Ellis Island. Visitors to the monument undergo additional security screening.